Cold Pressed. Wheatgerm Oil is a rich and nourishing oil that contains just about the highest level of Vitamin E to be found in any natural oil. Since Vitamin E is a powerful anti-oxidant, this makes Wheatgerm the perfect oil for treatments to restructure damaged, dry and mature skin, and help prevent further cellular damage. Due to the rich texture of Wheatgerm Oil it is not suitable as a base for massage, so add up to 20% of it to a lighter carrier oil for body massage treatments. Of course, it can be used directly on the face undiluted in treatments to nourish and soften dry, thirsty and lifeless skin. Wheatgerm oil also contains ferulic acid which is also an effective anti-oxidant that prevents premature skin ageing and reduces age spots. 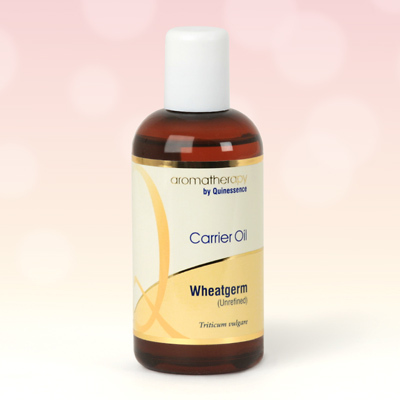 Wheatgerm Oil is also packed with carotenoids (more anti-oxidants) which provide further protection against skin aging and are responsible for the oil’s beautiful golden colour. This oil effectively combats all types of weather-induced skin damage such as sun-burn and chapped skin from the wind and cold winter weather, plus a whole host of irritated skin conditions. Unrefined Wheatgerm Oil has a noticeable aroma which is typical of the cereal, but since it is normally added to another carrier oil or used with essential oils the aroma is much less noticeable. The benefits it delivers far outweighs its aroma!